This topic contains 62 replies, has 27 voices, and was last updated by Sasha Adams 5 days, 15 hours ago. Nina, just spread your warp in your raddle as you normally would for winding on. You will space your warp for cramming and denting when you start slewing your reed. I just made the warp for this project and started to dress my loom and realized that I am not sure how to spread the warp in the raddle! I understand that the warp is sleyed through the reed with different denting in each section but I don’t understand how to spread it out in the raddle to wind on. I apologize if this topic was covered in the videos for this episode but I did not see it. Loved doing this one used variegated brown tencel.. I have a friend who owns a Baby Wolf and has woven with linen a lot using this loom. I asked her for tips. She said the best advice she could give was to not crank the tension on the warp. Make it just tight enough to have a clean shed, but don’t try to make it trampoline tight. Given that she rarely has issues, I’m going to go on faith that I can use my jack loom to make this sample, too. Pondering my plan for this sample, came across some 20/2 silk in my stash, just wondering if that would work okay as weft with the 40/2 linen? This reply was modified 2 months ago by Annette Beasley. Thank you, Jane! One of my looms does have the dip in the warp that you referred to. I will fearlessly give linen a go! I have only watched the first video, so I hope my question is not answered in later videos. I have been working on samples…trying to get the colour, weave structure and sett I am looking for jacket yardage. Jane cut the first bit off and then worked the density in areas with cramming and denting. This made the new fabric wider than original. That means that the warp tied on the back rod the warp is spread out for the original narrow. When the second wider fabric is being woven is there any concerns about the discrepancy of the width at the weaving and the back beam? I hope I haven’t caused any anxiety about using linen….I really want you to try using linen….so many weavers are scared of it, and there is a lot of hesitation around this fibre. Looms that have an equal tension on both parts of the warp weave linen beautifully. Many Jack looms do have a dip with the warp coming lower from the back beam into the heddles and then up again to the cloth beam (that is a great thing)…that is the equalizer for the warp so that the bottom part of the warp is dipping to counter the other part of the warp moving up….BUt, not all looms are created the same. You have to know your loom. There are so many different looms out there and I only know the ones I use. Any counter-balance loom has both parts of the warp in action as do counter-marche looms. The only Jack looms I have are Schacht and they have that beautiful dip which I’ve talked about in other episodes. The Louet David loom is a sinking Jack but if you look at the warp it comes out of the reed at the top therefore when you step on a treadle those threads moving down have an equal tension to those that are up. The same thing is happening on the Megado and Octado because while the harnesses just rise, the entire back beam of the loom rises up to create a counter-marche shed. Don’t be afraid, make a small warp and try it out…you have nothing to loose just so much to gain when you are learning about a new yarn and you are learning about your equipment. What would be awful is you not trying this magnificent yarn. Be adventurous and give it a whirl…you will most likely discover that you love love love linen. Jane said that when people have problems with linen, it may be that they are using a jack loom. Don’t think I want to intentionally warp a loom with a project that is likely to have issues. I’ll research some more before I invest in linen. This reply was modified 2 months, 1 week ago by Karen. Hi Karen, I think what Jane’s is saying (if I can put words in her mouth) is that she has never woven linen on a Jack loom herself. If you have access to a bit of linen, why don’t you put on a sample on your loom to see how you manage. Is Jane recommending that we do not weave with linen if we only have access to a jack loom? She says she only uses countermarch or counter balance looms for weaving linen. Would it be possible to weave with linnen on the Megado or Octado loom. I do have a David also, so no problem, just thinking if it would be possible. 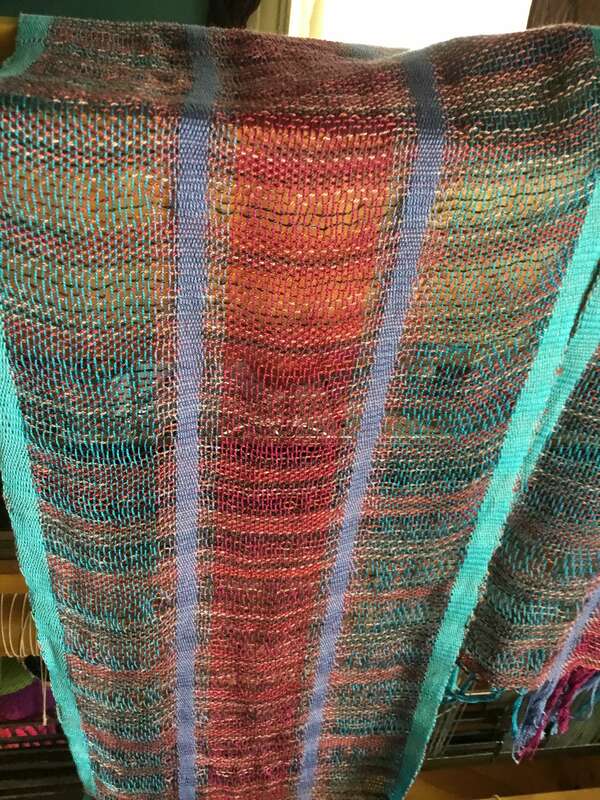 Warping with one linen thread is fine especially if you only have one cone of one colour to work with. I know with silk Jane recommends warping with minimum 2 threads in hand, is this true for the 40/2 linen as well? Would it be fine with just single thread in hand?